As the fall season progresses upon us, we begin to realize Halloween has come and gone, and in a glimpse of an eye we are preparing Thanksgiving meal. Before we know it, every street is flaming with lights and Holiday décor and there are Christmas trees for sale. Holiday shopping begins to consume our minds and the crisp winter chill makes us yearn for warm fireplaces and hot cocoa. The holidays are a time for family and friends to get together and indulge in the spirit and cheer; to travel to new places or return to old ones accompanied by loved ones and warm smiles. Almost every town or city around the world has holiday traditions that interest locals or “out-of towners”; the lighting of the Christmas tree in New York, the reenactment of the Nativity Scene in Spain and Italy, and many more. 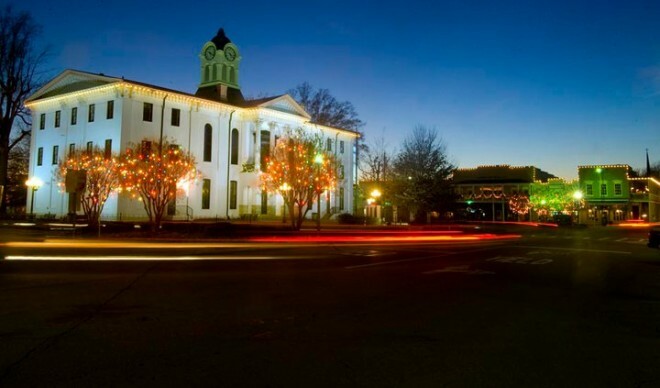 Surprisingly, in the small town of Oxford, Mississippi there are many holiday events to be celebrated through the month of December. As the degrees begin to drop and the trees begin to glisten, this homey, college town becomes a little like Santa’s workshop in the North Pole. Several family friendly events and shows are presented locally in hopes that many will attend. What: A free event open to the public of all ages. The Gingerbread Village supports local food banks and encourages visitors to donate non-perishable food items. Take a break from your busy day, and relax in the quiet and calm of a magical village made of gingerbread. In what is becoming an Oxford tradition, the Village is a sweet delight for the senses. Houses are built for the Village each year by are Gingerbread crafters. The Village will be open daily with additional evening and weekend hours planned. For more information about creating a gingerbread house for this year’s Village or scheduled times, call 662-915-6502 or email kmeacham@olemiss.edu. When: December 5th 10:00 a.m.-1:00 p.m.
Intersection of South 5th and University Ave.
What: A free Family Activity Day where families will start at the UM Museum to create seasonal crafts, eat yummy holiday snacks, and visit the Ford Center’s Gingerbread Village. All ages are welcome to participate and pre-registration is not required. What: The Oxford Lions Club produces the City of Oxford annual Christmas Parade. This Christmas Parade is a fun, free, and family event for those of all ages. The parade route will begin at Mid-Town Shopping Center on North Lamar and travel South towards the Square and then onto University Avenue ending at the Ford Center. Parade applications are available from the Oxford – Lafayette Chamber of Commerce, 229 Jackson Ave. (662-234-4651). Floats will be judged before the parade at Mid-Town Shopping Center. When: December 10th 7 p.m.-9 p.m.
What: The Holiday Ornament Auction is the Art Council’s largest fundraiser and helps us provide more and more art to our community each year. Last year we were able to knock out 334 days of art thanks to our generous donors and artist community. Our annual holiday party is free to all current members of the Arts Council (you can become a member or renew here). Come and enjoy culinary creations from different area chefs and compete for your chance to take home one of kind ornaments made by local artists! Artists who are interested in submitting an ornament for the auction will need to bring them to the Powerhouse no later than November 30th! Click here to download the Artist Submission Form! When: December 13th 3:00 p.m.
What: “Christmas with The Celts isn’t just a concert; it is a celebration of the holiday spirit, people, community and common connections. It’s about bring young and old together to celebrate this special time of year”.Christmas with the Celts is a blend of ancient traditional Irish and Scottish Christmas Carols mixed with American Christmas favorites performed with Irish instrumentation including uilleann pipes, whistles, bodhran, fiddles and more. Featuring 6 musicians, plus Irish dancing and narration of Christ’s birth told in the Scottish dialect by Laura McGhee from Dundee, Scotland. The high-stepping spirited musical selections in Christmas with the Celts range from classic Irish reels that will have audiences clapping along, to some ancient hymns and lively renditions of popular contemporary Christmas classics:, ‘Silent Night’, ‘Little Drummer Boy’, ‘Count Your Blessings’, ’First Noel’, ‘I’m Dreaming Of A White Christmas’ and John Lennon’s perennial ‘Happy Christmas’. For more information on these Oxford Holiday Events, please visit our website or give us a call.